As you enter the main gallery of the RHA you are immediately taken aback by the sheer scale of the works presented by the institution’s president Mick O’Dea. As well as the vast sculptors, which quite literally hang from the roof and walls, four huge canvases adorn each wall one apiece. O’Dea is known for his paintings of scenes from the War of Independence and it this more recognisable style that first greets you on the ground floor of the RHA. A collection of 18 portraits of participants in the 1916 Rising adorn the wall adjacent to the main staircase. As well as figures ingrained within the national consciousness, such as James Connolly and Padraig Pearse, figures who played vital roles during the revolutionary attempt and that are not as well known to the general public, such as James Daly and Michael Mallin, are also depicted. While these paintings provide a historical accuracy to the opening part of this show, it is immediately challenged as you enter the gallery’s main room. Working in mixed media for the first time in over two decades, O’Dea has crafted several large and striking sculptures of Daniel O’Connell, Britannia astride a plinth of doors, Nelson and the Sword of Light. As well as these four large works, over a dozen soldiers litter the ceiling of the room in a variety of poses, all of which suggest turmoil and destruction. This suggestion is further echoed in O’Dea’s painting of the fire which engulfed of RHA’s home at the time on Middle Abbey Street during The Rising. 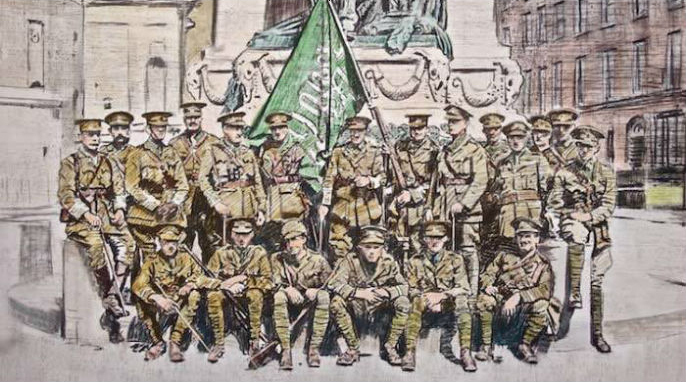 As well as the theme of destruction, the theme of military organisation is also prevalent within the work – highlighting Dublin’s important position as the 2nd city of the empire in 1916. While intrinsically about 1916, other times and events are hinted at by O’Dea in this exhibition. The sculpture entitled ‘Nelson’ sees half a man falling from the sculpture, a nod to 1966 and the destruction of the statue of the same name. The seagull atop the Daniel O’Connell piece speaks of a more peaceful time that could as easily be 2016 as a century before. Drama exists within these works and this is further emphasised by the dramatic spotlighting that is used. The Rising resonates within the Irish psyche in such strong and bold cultural terms that it is often easy to forget that it was a war. A city skirmish that claimed the lives of many on both sides. Nostalgia often masks this and the real success of this show is the way that O’Dea coaxes this out of the work and most of all the viewer.